Model development and analysis of biological systems is recognized as a key requirement for integrating in-vitro and in-vivo experimental data. In-silico simulations of a biochemical model allows one to test different experimental conditions, helping in the discovery of the dynamics that regulate the system. Several characteristics and issues of biological system modeling are common to the electronics system modeling, such as concurrency, reactivity, abstraction levels, as well as state space explosion during verification. 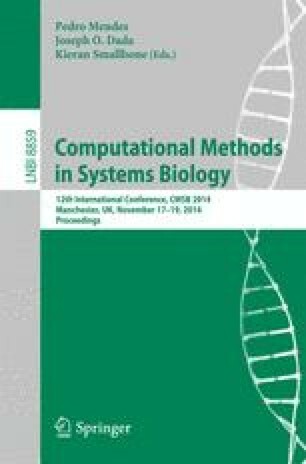 This paper proposes a modeling and simulation framework for discrete event-based execution of biochemical systems based on SystemC. SystemC is the reference language in the electronic design automation (EDA) field for modeling and verifying complex systems at different abstraction levels. SystemC-based verification is the de-facto an alternative to model checking when such a formal verification technique cannot deal with the state space complexity of the model. The paper presents how the framework has been applied to model the intracellular signalling network controlling integrin activation mediating leukocyte recruitment from the blood into the tissues, by handling the solution space complexity through different levels of simulation accuracy.